I spend a lot of time talking to restaurant operators about how they’ve made their businesses more efficient. Recently, I've been hearing about how a kitchen display system can be a big factor in efficiency for both quick- and full-service concepts. Kitchen display screens are the digital menu boards of the back-of-house. Often replacing or working in tandem with kitchen printers, KDS screens show line cooks and expediters what’s in the queue and how long it's been there. Orders are marked as fulfilled using a bump bar or touchscreen tablet, closing out the ticket and clearing the screen. 1894 Lodge in New Washington, IN doubled sales volume by increasing efficiency with a kitchen display system and a modern POS. 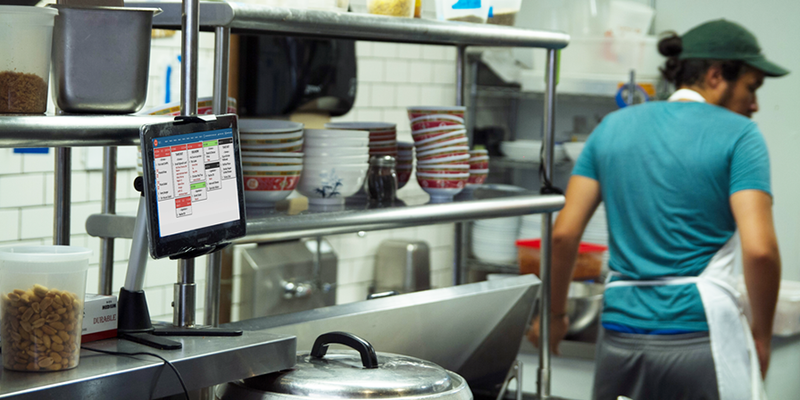 While a 100% increase in sales may not be a realistic target for your restaurant, KDS screens still have the potential to transform back-of-house operations. Errors and miscommunication between the front- and back-of-house is not only costly financially, but can destroy the customer experience. One consumer report found that 62% of consumer complaints stemmed from incorrect orders. Tickets on a kitchen display system do not get lost, fall on the floor, or accidently get placed out of order. There’s no chicken scratch to decipher. With a digital expediter screen, the expeditor can ensure everything on the order has been prepared and is ready to ship before it leaves the kitchen. With kitchen displays, every order is automatically timestamped from placement to fulfillment. Reliable data on the ordering experience equips restaurant operators to identify bottlenecks and points of optimization. How do ticket times change at busy hours? Are guests waiting significantly longer on Saturdays than they are on Wednesdays? This data equips restaurant operators to make better decisions on staffing, line optimization, and setting customer expectations. While KDS screens have been popular in quick service environments for years, modern KDS technology is catching up to the complexities of full service menus. With immediate, accurate communication between servers and kitchen staff, service is speeding up. “We saw our ticket times go from over an hour and a half, to only 40 minutes,” says Logan at 1894 Lodge. “This has helped improve our table turn times by 50%!" Keep in mind, these are the same folks who doubled sales by implementing a POS and digital ticketing system. While returns are not guaranteed to be that lucrative for everyone, there's a clear opportunity for speedier service. KDS screens are especially powerful when paired with a handheld ordering system. Not only do orders immediately appear on the KDS screen, but they’re fired by the server or cashier in front of the customer. Even if you’re not particularly eco-conscious, take a minute to estimate how much your restaurant spends on printer paper each year. Yes, you’ll be going green with digital kitchen screens, but there’s a cost savings potential as well. Jon Schroeter, owner of Il Primo Pizza & Wings, a 6-location business in central Florida, told me that the KDS screens save both money and hassle. Finally, a digital ticketing system allows for potential automation and mobile app integration. Eastman Egg, a grab-and-go breakfast restaurant in Chicago, perfected the egg sandwich on the go by integrating their in-app ordering with their KDS system. KDS screens allow for the opportunity to integrate with online websites and custom apps as digital ordering continues to grow in popularity. These are just a few example of how digital kitchen systems have improved these restaurant's workflows, but they offer a glimpse into its potential. Reducing use of impact printers in the kitchen can make a real impact on restaurant operations (see what I did there?). Do you use a Kitchen Display System? Let us know in the comments below!